Sample Application: User interface for an industrial conveyor oven where the digital display shows process oven time. The OMDC-DP4 is connected to the existing adjustable-frequency AC drive. The operator can select from 2 preprogrammed time settings or can manually make adjustments using the arrows on the display. The OMDC-DP4 is a microprocessor based digital speed potentiometer that can directly replace a conventional 3-wire analog speedpot or motorized speedpot for most AC and DC drives. The desired set speed is entered into the large ½" LED display through the convenient front-panel interface, and display units are now programmable for virtually any unit of measure. 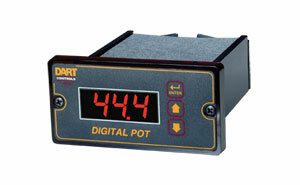 The OMDC-DP4 is easy to install into industry standard 1⁄8" DIN cut-out dimensions. The electrically isolated common signal permits direct wiring from the unit terminal block to the drive’s potentiometer terminal points. The OMDC-DP4 is ideal for new equipment as well as for retrofitting most AC or DC drive systems where precise, repeatable speed setting and digital readout are desired. The OMDC-DP4 is also ideal in applications where high vibration and other environmental factors can cause normal speedpot settings to drift. Note: Comes complete with operator's manual.